BEIRUT: Despite ongoing clashes between Hezbollah and Jabhat Fatah al-Sham in the surrounding mountains, the northeast Lebanese town of Arsal remains calm. “There is awareness from Lebanese residents and Syrian refugees that actions by either side that threatens the stability of Arsal would have negative impacts on them both,” Arsal Mayor Bassil al-Hujeiri told The Daily Star Monday. As of Monday night, UNHCR had recorded 148 families, totaling some 383 individuals – 39 Lebanese nationals and 344 Syrian – crossing from the outskirts of Arsal into the town through an Army checkpoint near Wadi Hmayed. They reported that no males over 14-years-old have been allowed through the checkpoint and so those crossing have been women and children. The mayor said that nearly 100 people a day since Friday had crossed into Arsal. UNHCR’s regional head for the Bekaa Valley, Josep Zapater, said that the numbers were not currently enough to be a concern given the contingency plans in place. However, he added that several families that arrived over the weekend had not eaten in two days. If the numbers rise, Zapater said the agency would have to consider accommodating people in other areas of Lebanon, but for now they would stay in refugee settlements in Arsal. UNHCR also noted that some 12 unaccompanied children had crossed into Arsal and were now being assisted by an International Rescue Committee child protection team. 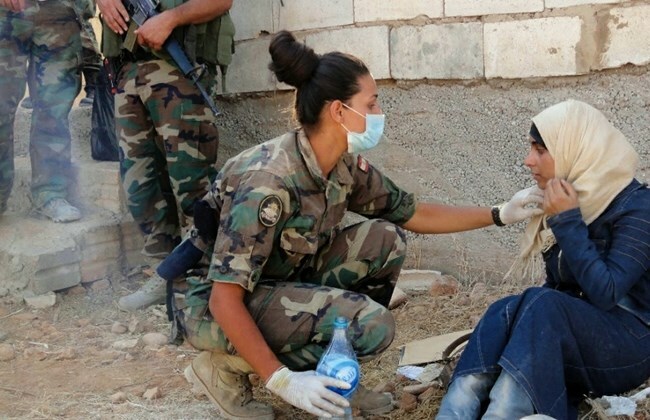 “As for today [Monday], no one entered because the road was cut off; however, there is ongoing coordination between the Lebanese Red Cross and the Army for anyone in dire need of help to be able to come to Arsal,” Hujeiri added. However, Zapater said Monday evening that a small number of people had crossed during the day and images of the Army assisting new arrivals with water were distributed by the military. Hujeiri said the Red Cross, UNHCR and Dar al-Fatwa were providing the bulk of the assistance. 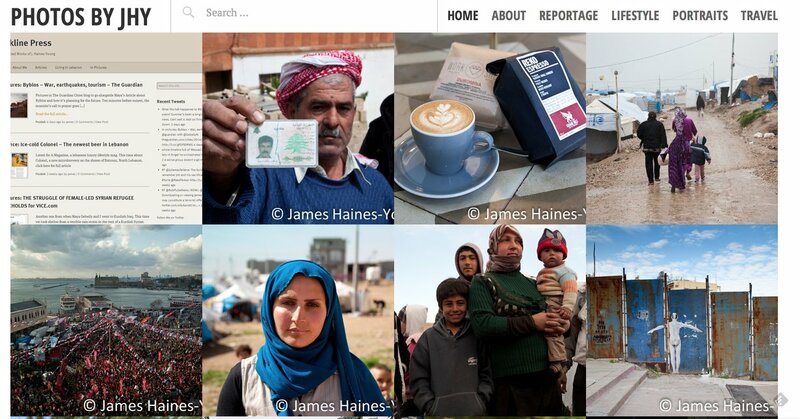 “Dar al-Fatwa, UNHCR and Red Cross are helping the refugees every single day,” he explained. UNHCR official added that the non-food items were being provided by the refugee agency. “We have warehouses with Dar al-Fatwa so we’ve been sending items there [since] we knew that something was going to happen [in Arsal] and then they have been distributing that as they have the teams on the ground,” Zapater said. The Army was unavailable for comment and Red Cross Director-General George Kettaneh said Arsal’s mayor would be able to give more accurate details on the humanitarian situation in the area. “The situation is as stable as [it] can be inside [Arsal]. As for outside Arsal, we don’t have a clear idea of what is happening or what the current status of the clashes are,” Hujeiri said. Zapater also said that it was hard to gauge the situation and needs of refugees in camps near to the fighting. “Reports have been received of persons without assistance and close to active conflict areas on the outskirts [of Arsal] which are very difficult to verify independently due to the lack of access for humanitarians,” Monday evening’s UNHCR situation report for Arsal noted. A source told The Daily Star that four refugee women had been wounded by stray bullets in a refugee settlement beyond the Army’s cordon. However, the mayor, UNHCR and the Red Cross could not provide details of the incident and no other information was provided by the source. 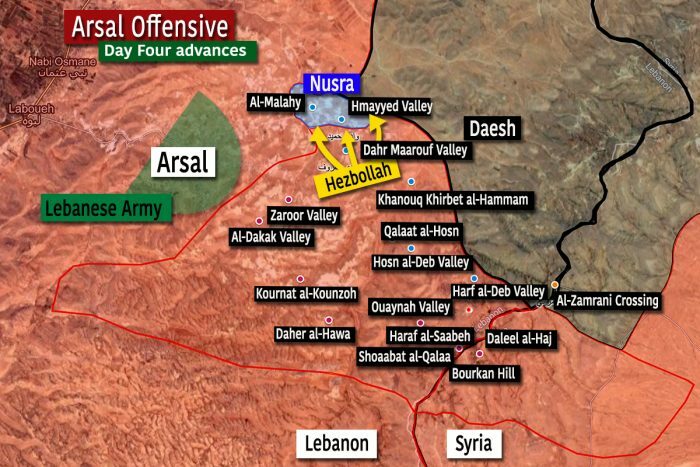 Throughout the day Hezbollah made fresh advances on the last positions held by Jabhat Fatah al-Sham – previously known as the Nusra Front – cornering them in their last remaining territory not far from the outskirts of Arsal in Wadi Hmayed. It is not uncommon for gunfire to mark commemorations, ceremonies, weddings or funerals in many towns across Lebanon. “Like I said, no one wants to destabilize the town and so, for now, we are calm and collected,” Hujeiri said. A version of this article appeared in the print edition of The Daily Star on July 25, 2017, on page 2. Tags: Arsal, ISIS, Living in Lebanon, millitant, Nusra, and syria.